Stems stout, rarely branched, 2 to 5 feet high, finely pubescent above. Leaves oblong to ovate, finely but densely hairy beneath, smooth above when mature, pointed or blunt at the apex, rounded or slightly heart-shaped at the base, 4 to 8 inches long, 2 to 4 inches wide; petioles short, one-fourth to three-fourths of an inch long. Flowers numerous in one to several umbels on long stalks from the upper axils of the leaves; corolla purplish to greenish purple or greenish white, the segments oblong-lanceolate, one-fourth to one-third of an inch long; column short and thick, the hoods ovate-lanceolate with a tooth on each side, longer than the anthers and the incurved horn. Fruiting follicles 3 to 5 inches long, erect on recurved stalks, tomentose and covered with short, soft processes. Roadsides, fields and waste places, New Brunswick to Saskatchewan, south to North Carolina and Kansas. Flowering from July to September. The form illustrated here is the purple-flowered form which is not so common as the greenish purple-flowered form. 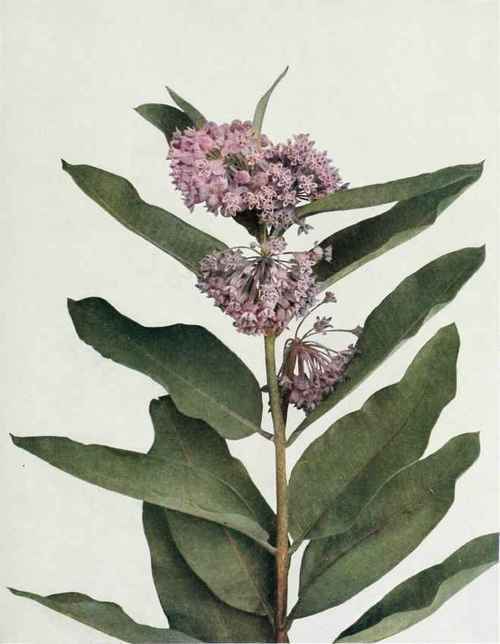 The Purple Milkweed (Asc1epiaspurpurascens Linnaeus), rather ran' in this State, has smooth or puberulent stems, ovate, elliptic or oblong leaves, smooth above and finely pubescent beneath; flowers deep purple; corona hoods oblong or ovate and nearly twice as long as the anthers, the horns broad at the base, slender and incurved at the apex. The follicles are downy and without the soft processes of the Common Milkweed.